Hard failover allows a node to be removed from a cluster reactively, because the node has become unavailable or unstable. 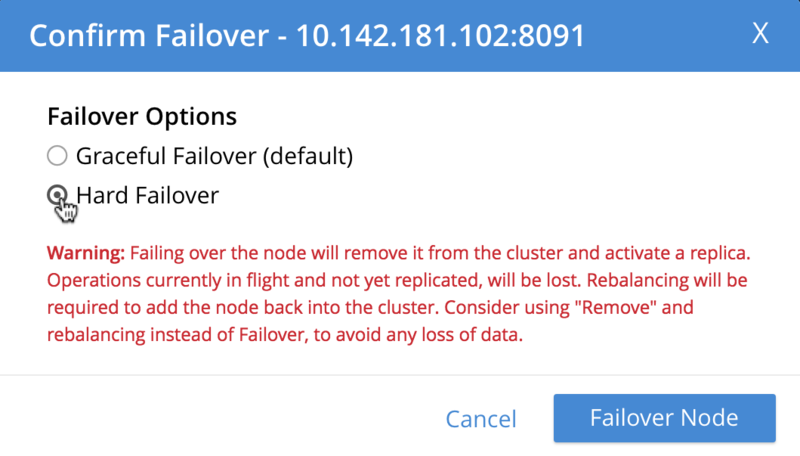 Hard failover drops a node from a cluster reactively, because the node has become unavailable or unstable. It is manually or automatically initiated, and occurs after the point at which active vBuckets have been lost. The automatic initiation of hard failover is known as automatic failover, and is configured by means of the Node Availability screen, in the Settings area of Couchbase Web Console, or by means of equivalent CLI and REST API commands. This page explains how to initiate hard failover manually. A complete conceptual description of failover and its variants (including hard) is provided in Failover. Note the warning message that appears when hard failover is selected: in particular, this points out that hard failover may interrupt ongoing writes and replications, and that therefore it may be better to Remove a Node and Rebalance, than use hard failover on a still-available Data Service node. To continue with hard failover, confirm your choice by left-clicking on the Failover Node button. 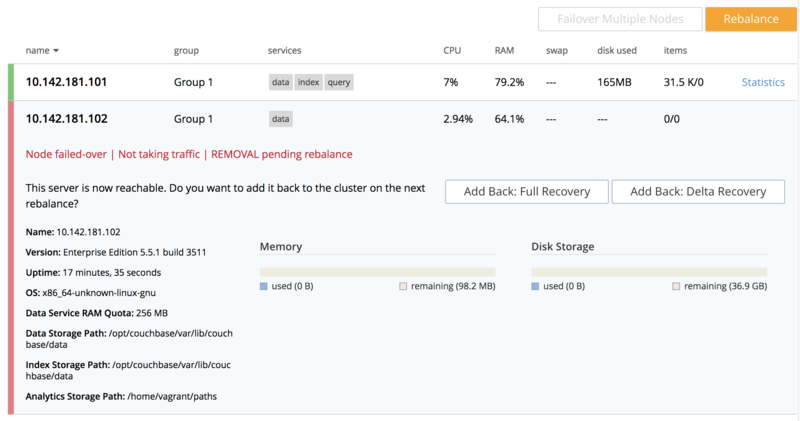 This indicates that hard failover has successfully completed, but a rebalance is required to complete the reduction of the cluster to one node. The --force flag specifies that failover be hard. For more information on /controller/failover, see Failing Over Nodes. For more information on /controller/rebalance, see Rebalancing Nodes. A node that has been failed over can be recovered and reintegrated into the cluster. See Recover a Node.